In investments, cash flow represents earnings before depreciation, amortization, and non-cash charges. Sometimes called cash earnings. Cash flow from operations (called funds from operations by real estate and other investment trusts) is important because it indicates the ability to pay dividends. 1. Cash that comes into or goes out of a person's or company's account. Cash flow can come from any number of sources and is crucial for a business' continued operation and a person's continued survival. Cash inflow may come from wages, salary, sales, loans, revenue from operations, or even personal gifts. Cash outflow usually comes from expenses and investments. It is crucially important to maintain a positive net cash flow insofar as possible. 2. In accounting, an item on a financial statement indicating cash flow. The amount of net cash generated by an investment or a business during a specific period. One measure of cash flow is earnings before interest, taxes, depreciation, and amortization. Because cash is the fuel that drives a business, many analysts consider cash flow to be a company's most important financial statistic. Firms with big cash flows are frequently takeover targets because acquiring firms know that the cash can be used to help pay off the costs of the acquisitions. See also free cash flow. Case Study Financial analysts generally consider cash flow to be the best measure of a company's financial health. Increased cash flow means more funds are available to pay dividends, service or reduce debt, and invest in new assets. On the other hand, reported net income is heavily influenced by a firm's accounting practices. Reduced income generally means lower taxes and more cash, thus the same accounting practices that reduce net income can actually increase cash flow. A firm with large amounts of new investments and corresponding high depreciation charges might report low or negative earnings at the same time it has large cash flows to service debt and to acquire additional assets. Cable companies have huge investment requirements and are typical of firms that may be quite healthy in spite of reporting net losses. In early 1996, TCI Communications, at the time the nation's largest cable operator, reported fourth-quarter results that included a net loss of $70 million, more than double the loss reported in the year-earlier quarter. At the same time, the firm added more than a million new customers and reported a 25% increase in revenues. It also reported a 5% increase in cash flow. Thus, although TCI reported an additional loss, the quarter was generally considered quite successful. Operating cash flow, calculated as cash flow (the sum of net income and noncash expenses such as depreciation, depletion, and amortization) plus interest expense plus income tax expense, is an important consideration in corporate acquisitions because it indicates the cash flow that is available to service a firm's debt. Cash flow is a measure of changes in a company's cash account during an accounting period, specifically its cash income minus the cash payments it makes. For example, if a car dealership sells $100,000 worth of cars in a month and spends $35,000 on expenses, it has a positive cash flow of $65,000. But if it takes in only $35,000 and has $100,000 in expenses, it has a negative cash flow of $65,000. Investors often consider cash flow when they evaluate a company, since without adequate money to pay its bills, it will have a hard time staying in business. You can calculate whether your personal cash flow is positive or negative the same way you would a company's. You'd subtract the money you receive (from wages, investments, and other income) from the money you spend on expenses (such as housing, transportation, and other costs). If there's money left over, your cash flow is positive. If you spend more than you have coming in, it's negative. Fig. 18 Cash flow. A trader sells 10 units at £10 each will cost £5 each. the money coming into a business from sales and other receipts and going out of the businesses in the form of cash payments to suppliers, workers, etc. Cash receipts and cash payments in a trading period are not necessarily the same as the accounting revenues and cost applicable to that same period, because customers need not pay cash for goods sold until some time afterwards while the firm may not pay for materials and services used until afterwards. Fig. 18 overleaf shows the main causes of disparities between cash flow and profit. See SOURCES AND USES OF FUNDS STATEMENT. the money coming into a business from sales and other receipts and going out of the business in the form of cash payments to suppliers, workers, etc. (1) Noun:The cash available from an investment after receipt of all revenues and after payment of all bills. (2) Verb:The process of creating cash flow,as in “I think that property will start to cash flow in about a year.”A property can have positive cash flow (good) or negative cash flow (usually bad).Cash flow is not the same thing as profitability.A property can be profitable,meaning gross income less expenses, depreciation, and interest on debts results in a positive number. That same property can have a negative cash flow because of the need to pay principal payments on loans or expend money for something that represents a capital expenditure,like a new roof. To date, neither text writers nor analysts have developed ratios for effective evaluation of the statement of cash flows. 35 (times) x, Fitch believes these conditions do not represent a relative risk to NE Energy; the level of cash flow that just barely satisfies NGC's distribution conditions is already insufficient to satisfy NE Energy's direct obligations. Issued July 20, 2001, these new rules for business combinations, goodwill and intangibles suggest analysis of historical and future cash flows to determine asset valuation (see "The Merger Game Changes," page 22). The cash flow statement presents all of the cash flows pertaining to the merger or acquisition in the cash flow from investing activities as one item. While the deterministic method provides a simple pricing approach, portfolio modeling using deterministic cash flows is fundamentally flawed. At the time of the acquisition, the property had a net cash flow, before capital improvements of $476,000, yielding the investors a cash on cash return of 9. 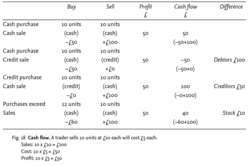 One method of determining fair value is to discount the projected net cash flows the asset will generate. As it turns out, all cash flows are not created equal when it comes to boosting market capitalization. In effect, two known inputs (predicted future cash flows and observed market value) are used to impute the apparent consensus market rate of return on the asset or liability. Over the medium term, projected 2008 dividend cash flows to AEI are expected to cover debt service by slightly more than 4x on average. For external purposes, he says, not much more is needed than cash flows, an overall understanding of business activity and profitability by major type of operation.